For the last few years Samsung has attacked the premium smartphone market with the Galaxy line, but that’s not the only phones it has available. The company has a more budget-friendly A-series for those who don’t want to drop $1,000 on a smartphone. The Galaxy A line is where you look when you don’t want to dole out a chunk of money. The rub? You don’t get all the fancy bells and whistles in the Galaxy S family. 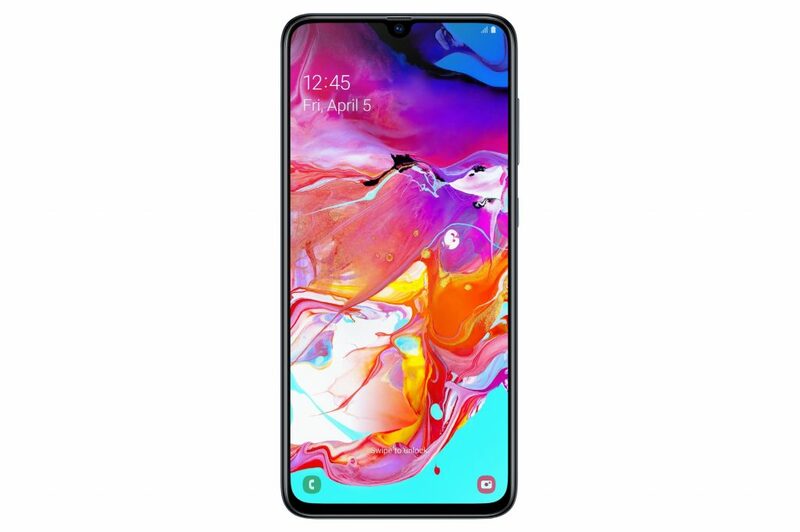 However, that doesn’t mean that the A lineup can’t have a high-end model and now it has one in the Samsung A70. Samsung has announced the latest phone for its 2019 mid-range with many of the same options available from its Galaxy siblings. The A70 has 6.7″ Infinity-U display Super AMOLED FHD+ (1080×2400) with 20:9 aspect ratio. This brings a much taller and thinner display to the A70 that of its brethren but should make the large screen easier to hold. The tradeoff may be that it will also make it hard to reach the full length of the display. The display also houses an in-screen fingerprint scanner similar to that of the Galaxy S10. This should allow for Samsung Knox security measure and additional options for apps like Samsung Pay and Samsung Pass. 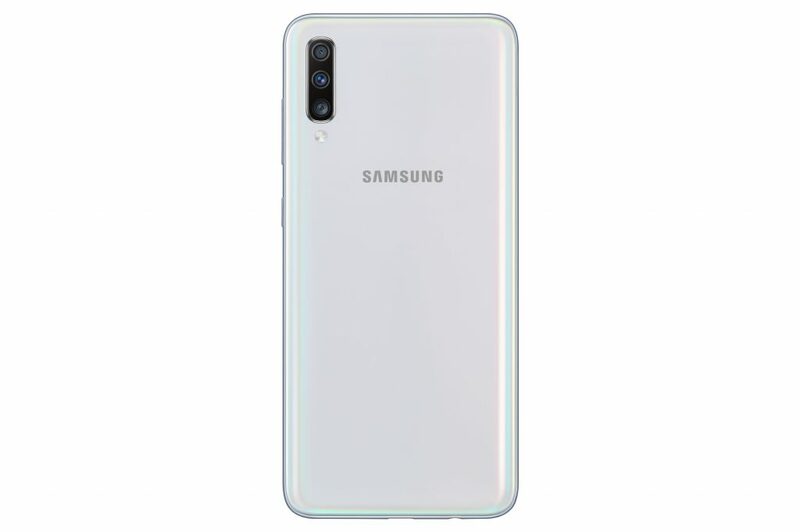 The Samsung A70 has a 32MP shooter on the back and the front of the device. The front camera is housed inside a tear-shaped notch much like on the Essential PH-1 and has an aperture of F2.0 Around the rear you’ll find another 32MP camera with F1.7 aperture, but it’s not alone. You also get an 8MP wide angle and a 5MP depth sensor. Rounding out the spec sheet is a pretty compelling combination of 6 or 8GB of RAM, 128GB of storage with microSD expansion, and a 4500mAh battery. The powerhouse can also be charged with Samsung’s 25W fast charging when you need to top off the tanks while in a hurry. 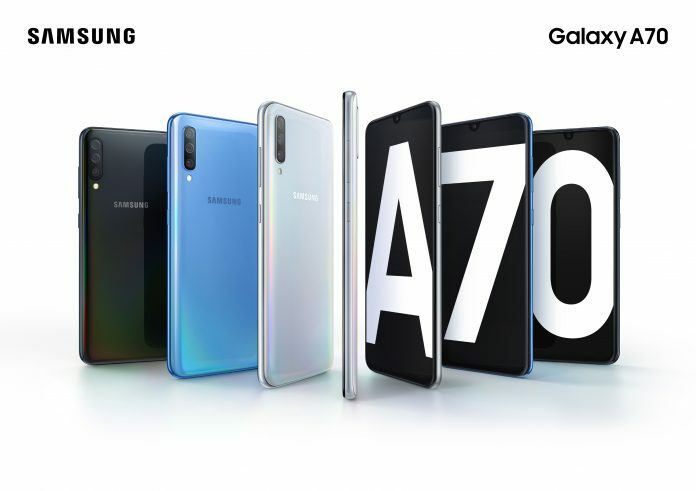 The A70 will launch with the latest version of Samsung’s version of Android Pie, One UI. Along with the base OS, the device will have Bixby, Samsung Pay, and Samsung Health all onboard. The company has done an admirable job of keeping the base software fairly close to the premium alternatives. Samsung has not released full pricing or availability just yet on the A70. However, the company has saved the date for an “A Galaxy event” for early next month on April 10th. Stay tuned for more information as it comes available for the A70.